Since I'm switching to digital for my 2014 Project Life album, I have a lot of physical kits and supplies that I still would like to use. 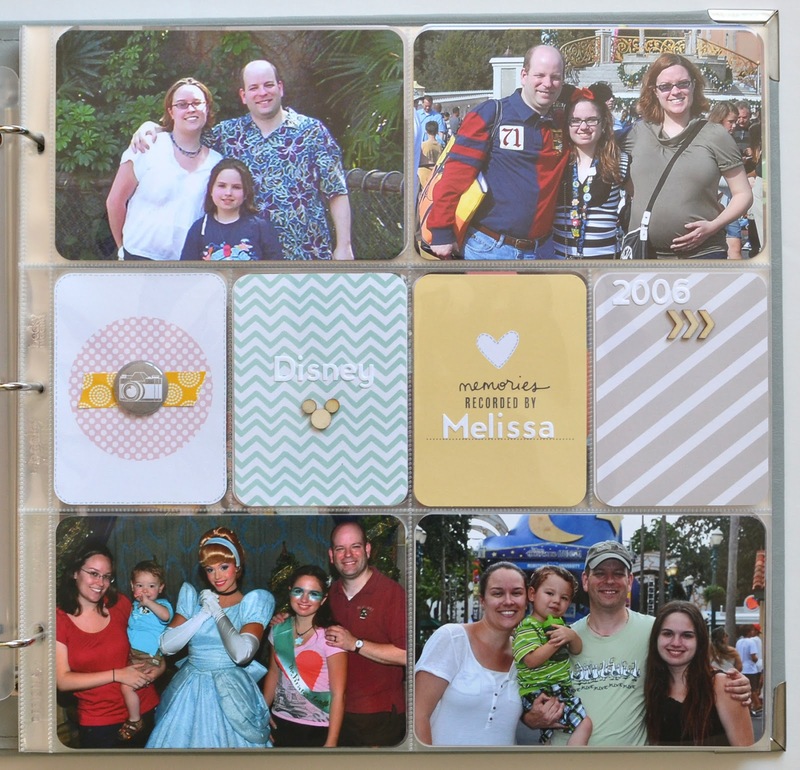 I also received two absolutely gorgeous grey faux leather Project Life albums for Christmas that I want to play with. (These albums are awesome and they even come with a sampling of page protectors and an envelope page). I decided that I would like to use one of these albums to document all of our Disney trips. I'm sure you're aware that we are huge Disney fans, and we've visited Walt Disney World every year since 2006. In 2007 we even went twice, as my oldest brother got married at the Boardwalk. 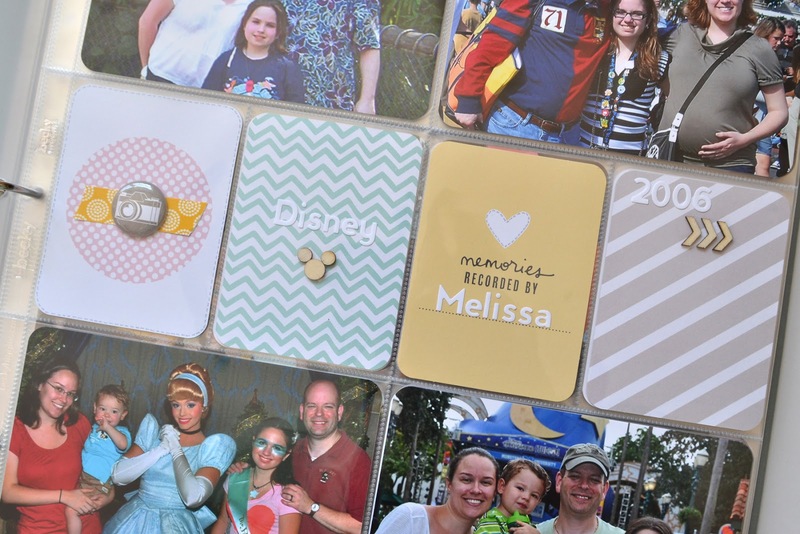 I thought it would be fun to have an album just for our trips, that I could keep adding to as we go on more vacations to WDW. Last week I had the photos for 6 of those trips printed up. The latest 3 trips all have so many photos I needed a little more time to pull together, so I'll work on these first trips and print the others later. I finished my first page over the weekend and wanted to share it with you. I'll share the progress of the album as I go, probably a couple of trips at a time. 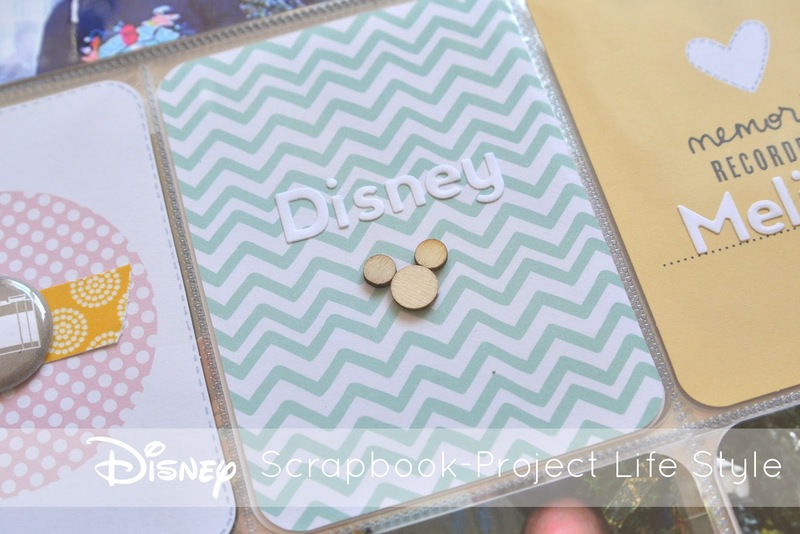 I am not sticking with Disney-specific supplies (as much as I love Disney I am not a fan of those bold, primary colors) or one particular kit, rather using up various kits from my Project Life stash. I am also sticking with Design A page protectors, and will use inserts as needed. For my title page, I added four photos from our trips - the top left being 2006, our first trip. Next is our 2010 Christmas trip where I was pregnant with Austin. The bottom two photos are 2012 and 2013. It is really cool for me to see the change in our family as we progress through the years. When we first went, Summer was only 9 years old, and we weren't even engaged yet. Now we're married with a toddler son. The first card is from the Project Life Teen Girl theme pack and the other 3 are from the Blush core kit. For the Mickey head, I used these Studio Calico wood veneer circles. I used more Studio Calico wood veneer, this time chevrons, over on the card on the right. This card says 2006, and I have the chevrons kind of as a "to." When this album is full, I'll add the year of that last trip. The alpha stickers I used are from Jillibean Soup. I like the consistency of using the same alpha across all 3 cards. For the first card, the original card says "2Day" on it, but as this isn't a daily album, I wanted to cover that up. My solution was a strip of yellow washi tape from Freckled Fawn (layered over white card stock so that it was not see-through), with a super cute flair button from The Flair Shop on Etsy. The last step was to add some hand drawn stitching in a light grey color around the border of the white card, and inside the heart on the yellow card. That's my title page. I love that it isn't overly Disney themed. It's also fairly simple but still has a creative touch to it. Love how you made the wooden mickey head! This is a great idea for using those albums (and that grey is beautiful! ).